3Doodler Create 3D Printing Pen -NEW!! The 3Doodler Create is the newest version of the most popular 3D printing pen in the world. 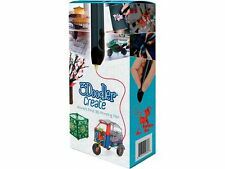 Compact and easy to use, this 3Doodler Create makes sure that every creative soul can do their thing. Just as the 3Doodler 2.0, this 3Doodler Create is the perfect tool to make drawings in 3D. 4.5 out of 5 stars - 3Doodler Create 3D Printing Pen -NEW!! 12 product ratings12 product ratings - 3Doodler Create 3D Printing Pen -NEW!! 3Doodler Create 3D Printing Pen -NEW!!. Condition is New. Shipped with USPS Priority Mail. This is a 3doodler create 3D printing pen in excellent condition.The pen has been tested and is working great.Comes complete with all tools and accessories,contains 45 plastic color strands (one of the strand packages was opened and 5 were used,so the pen was used very little) The Box has a small tear view last picture.Please view all photos and email any questions. Please view all my other listings. I will combine shipping when available.Continental USA shipping only. In the event you have a problem with your item, please contact us & give us the opportunity to resolve the issue prior to leaving feedback. We are reasonable people & take great pride in our business & providing exceptional customer service. New open box. Everything you see in the pictures is included. Consider that if you have an allergy. Sorry for the inconvenience. 3Doodler Create 3D Printing Pen And Nozzle Set both sealed new in box. 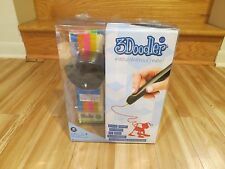 Great looking 3doodler create Enthusiast bundle new in package. If you have any questions or need more pictures please let us know. We have tons of other listings with things changing every day so take a look at all of our other items. This is a 3Doodler with a Nozzle set, Doodle stand and ABS plastic sticks. Bought as a gift but not used. Provides plenty of fun for the artistic little ones. 3Doodler Pedal. The 3Doodler Pedal gives you the freedom to doodle from various angles. Press the right pedal for fast extrusion, the left pedal for slow extrusion. Only 6 strands of plastic were put through this pen. Comes with two packs (44 total pieces) of abs and pla plastic as well as the pen and all of its original pack in items. Compatible with the 3Doodler v.1, 2.0 and Create. Manufacturer WobbleWorks, Inc. Item Weight 3.7 ounces. Product information. Trending at $12.62eBay determines this price through a machine learned model of the product's sale prices within the last 90 days. For sale is one New 3Doodler Enthusiast Bundle with ABS Plastic Sticks, Stand, Nozzle set. I am a very easy person to deal with and I'm sure that in such a case we can find a solution. Plastic refills for your 3Doodler 3D Printing Pen. Take your 3D prints to the next level! Here is a complete 3D printing pen! There are all the accessories included as well as a bunch of different colors to print in. Note that this is second-hand. 3D ART MADE EVEN EASI ER: From hobbyists to crafters, artists and professionals, 3D creation has never been easier. This is a 3Doodler with Nozzle set, Doodle stand, and ASB plastic sticks. Original price was 169.99 from Marbles. 3Doodler Pedal - Brand New! Use your 3Doodler V.1, 2.0, or Create with the Pedal! Item Weight 3.68 ounces. Well, we've created the 3Doodler Pedal specifically for more versatile 3Doodling. Compatible with the 3Doodler v.1, 2.0 and Create. 4 out of 5 stars - 3Doodler Pedal - Brand New! 1 product rating1 product ratings - 3Doodler Pedal - Brand New! 1 x E3D Single Head Double Color Extruder with Cooling Fan. Applications: 3D printer accessories. Wish to Combine a clothing item with a breakable (glass ware, pictures. ). By WobbleWorks Black. Give your fingers a break. Use the 3Doodler Pedal for those longer 3Doodled projects! 3Doodler Flexy Filament Strands Clearly FLX11-CLR 25 Strands. Condition is New. Shipped with USPS First Class Package. For use with the 3Doodler 2.0 and 3Doodler v.1. You can create flexible, rubbery, bendable doodles with stretchable properties. 3Doodler Pedal Brand New FREE SHIPPING . Condition is New. Shipped with USPS First Class Package. The key essential to creating your best doodles are ABS ‘matte’ plastics. Perfect for if you want to Doodle creations that require a sturdier base, such as the Eiffel tower. 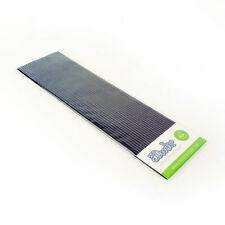 Abs plastics spiral and draw upwards off the page with ease.